Premium performance lubricants, guaranteed by a reliable brand! EKO lubricants are made of high quality base oils and additives and are designed to meet a broad range of lubrication needs, from the simplest to the most stringent application. EKO lubricants new engine oils range meets all the required specifications of the modern engines manufacturers of passenger cars and commercial vehicles. They are carefully designed to meet all the advanced technical specifications and packed in high quality packages labeled friendly to the user. 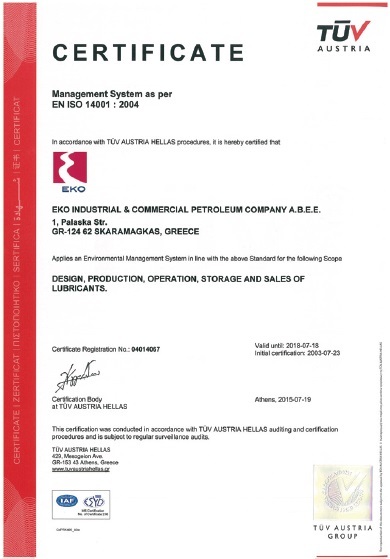 EKO lubricants have been developed to meet all the requirements of the REACH regulation on the safe use of chemicals and the CLP regulation on the classification, labeling and packaging, which aligns existing EU legislation to the United Nations Globally Harmonized System (GHS). EKO lubricants applications are supported by special technical advisors, either on the field or through any other communication, always upon request. The specifications of the products may change at any time, without prior notice, due to the continuous product development procedures and the technical evolutions of the equipment. Always consult the Product Data Sheet. For the safe use of the product, consult its Safety Data Sheet. 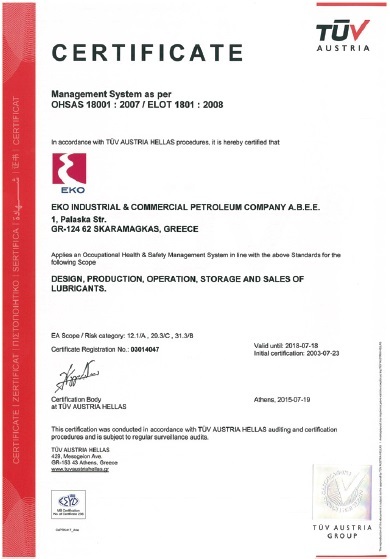 The procedures applied on the design, production, storage and distribution of EKO lubricants are certified according to the EN ISO 9001 quality standard, EN ISO 14001 standard for the environmental management and the OHSAS 18001 for the health and safety management. 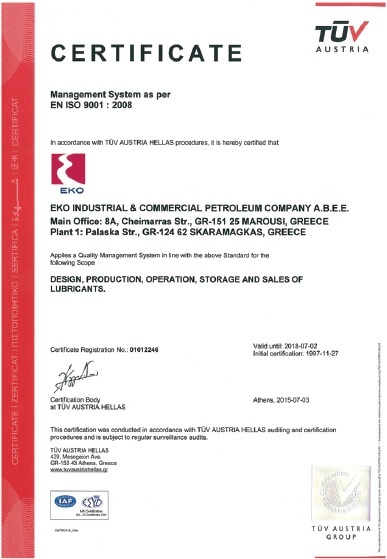 The above accreditations constitute the commitment of HELPE group to the adoption and implementation of international standards, codes and best practices to its activity in lubricants.